Two benefit activities are planned to benefit Soo Theatre Project's STARS program. The first is a flea market sale on November 3rd at the Soo Theatre. The second is a bottle and can drive from now until Thanksgiving. This drive will provide funds for an educational field trip for the adult and teen ballet classes on Thanksgiving weekend. Please bring your returnable bottles, returnable cans, or cash to the STARS office to help with expenses. New seven-week classes in dramatic arts and yoga will begin October 29 at Soo Theatre Arts Resource Studios (STARS), 534 Ashmun St., Sault Ste. Marie, MI. Speech and Dramatic Arts for children grades 3-6, taught by Dottie Case, will meet Thursdays 4:30-5:30 pm. Tuition is $70. Students will develop stories into reader’s theater. Morning yoga classes will meet Tuesday and/or Thursday 9-10:30 am. Tuition is $77 for one class and $140 for both classes. Lunch hour yoga will meet Monday and/or Wednesday 12:10-1 pm. Tuition is $63 for one class and $112 for both classes. An evening yoga class will meet Thursdays 5:30-7:00. Tuition is $77 for this class. Led by Lee Carlson, all yoga classes are open to beginners as well as those experienced in yoga. Register now for these new classes. Registrations are taken in person at the STARS office, 10 am to 8 pm. For more information, call 632-1930. 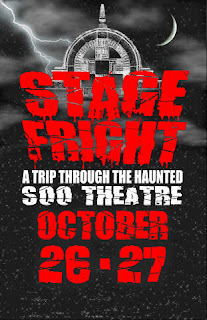 The second annual Soo Theatre haunting production, Stage Fright, is coming this Friday and Saturday night, October 26 and 27. Directed by Larry McCoy, an expert in all things paranormal, a cast of fifty-plus volunteers has been working all month long transforming the historic downtown theater into a ghoulish playground for the embodiment of dread. Renovations are now complete, and séances have confirmed that the undead are coming. Monstrosities will be arriving via limousine and walking the red carpet into the Soo Theatre at 5:45 on Friday night and 6:45 on Saturday. Immediately after the macabre inhabitants have entered the Theatre, the public will be dared to do the same. Guides will attempt to keep guests from coming to harm. However, double-checking to make sure that your life insurance policy has not expired is advised. This is not a run-of-the-mill haunting. Guests are guaranteed to witness to things not usually viewed by the public. All proceeds generated from your courageous participation go to support Soo Theatre Project and Soo Theatre Arts Resource Studios. Explore the depths of your nerves and support the local arts at the same time. Do you have what it takes to survive Stage Fright? Soo Theatre Arts Resource Studios (STARS) will be offering a workshop, “Introduction to Yoga Basics: The Universal Principles of Alignment” on Saturday, October 20, 2007, from 9 a.m. to 12 noon. Tuition for the workshop is $35. The workshop will be led by Lee Carlson, STARS yoga instructor. Students will learn and practice universal principles of body alignment to improve posture and promote healing by re-balancing the body’s energy flow. Yoga principles can help relieve discomfort associated with sitting, standing, or driving for long periods of time. No experience is needed to participate. All levels are welcome. Registrations are now being accepted at the STARS office, 534 Ashmun St., Sault Ste. Marie. Advanced registration is encouraged. For more information, call (906) 632-1930.